Thinking of moving to Spain? Our guide has everything you need to know when buying a Spanish property or moving to Spain. If you’re thinking of moving from the UK to Spain and becoming one of many British expats enjoying the Spanish weather, you may have a lot of questions. 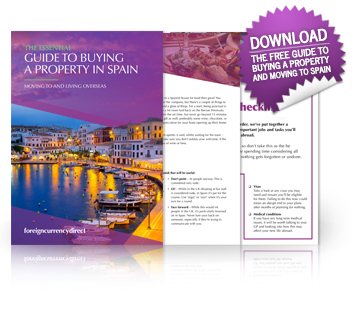 To answer these we have created a free Moving to Spain Guide for you to download. We’ve covered everything you need to know. Along with an emigration checklist to help you get prepared, we’ve included information on healthcare, selecting an estate agent, buying a property, taxes and finance, and even some pointers on Spanish culture. All you need to do is enter your details in the form and you’ll get instant access to our free moving abroad guide. We hope it helps you get on your way to Spain and living a wonderful new life abroad. Excellent Service. The service was as usual very efficient and the money was in my Spanish bank account within an hour of making the call. Daniel Wright at Foreign Currency Direct came highly recommended to us by a friend and he and the Company have lived up to this recommendation with every transaction they have completed for us. We used them only last week and spoke with Daniel for only a few minutes and the funds were in our Spanish Bank Account later that day at the best exchange rate one could get on the day. We would never use anyone else to transfer our funds abroad.